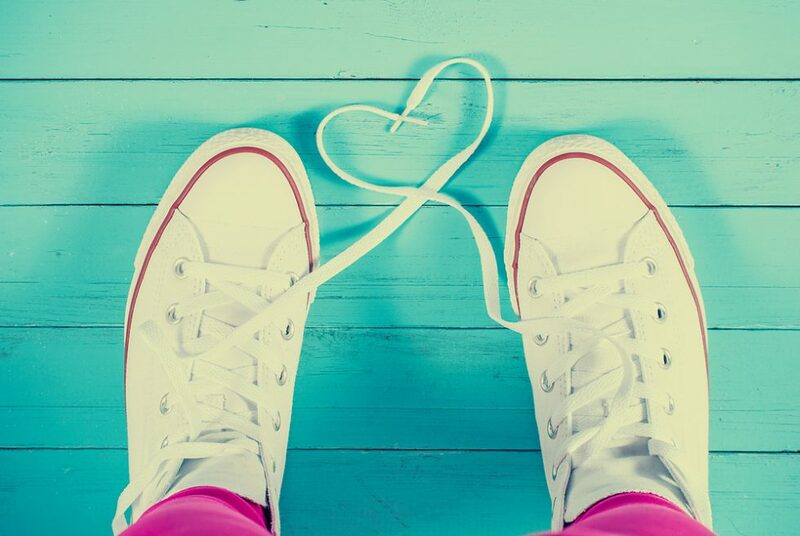 It’s no secret that materialism and a general obsession with stuff has overtaken our society. Many people measure success by the amount of money they can afford to spend on flashy clothes, expensive cars, and the newest technology – and as hard as we might try to curb these materialistic tendencies in our children, it isn’t surprising to notice them emerge at an early age. While these behaviors are especially prone to coming out after holidays that involve lots of gift-giving, like Christmas or birthdays, they can arise virtually anytime, presenting an interesting parenting challenge to overcome. If you’re looking for a way to shift your child’s focus away from physical things and help them see the value in helping others, I invite you and your family to participate in my 30 Days of Kindness Challenge. This simple challenge is designed to show your family just how much fun you can have when you give back and shift your priorities from buying stuff to making an impact. This challenge is open to all families looking to practice kindness together, and it’s absolutely free to participate! Show kindness toward others at home, in your neighborhood, and in your community. Surprise and delight neighbors, strangers and acquaintances with thoughtful actions. Donate things you no longer need to those who could truly use them. Improve and enhance your local community. At the end of the 30 day challenge, you and your family will emerge with a new outlook on the importance of kindness and its place in your life, refocused priorities, and lots of great ideas around ways you can help those around you. If you’re ready to challenge your family to infuse a little more kindness into your days, click here to sign up. 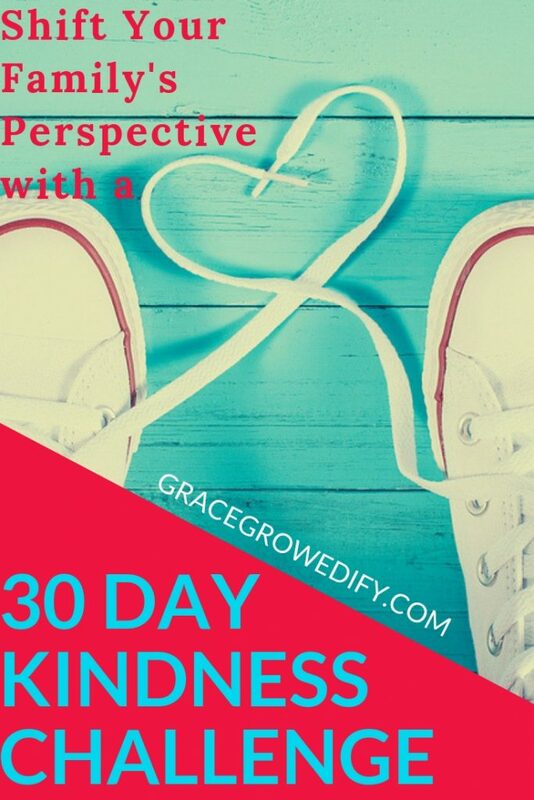 You’ll receive a free 30 Days of Kindness Challenge printable checklist to keep your family on track, as well as a few helpful emails to keep you on track! Day 1 – Pay for someone’s coffee or meal behind you. Day 2 – Hold the door for a stranger. Day 3 – Donate a bag of gently-used clothes to a local charity. Day 4 – Do something nice for your sibling. Day 5 – Let someone go ahead of you in line. Day 6 – Surprise a friend with flowers. Day 7 – Compliment a family member. Day 8 – Put change into an expired meter. 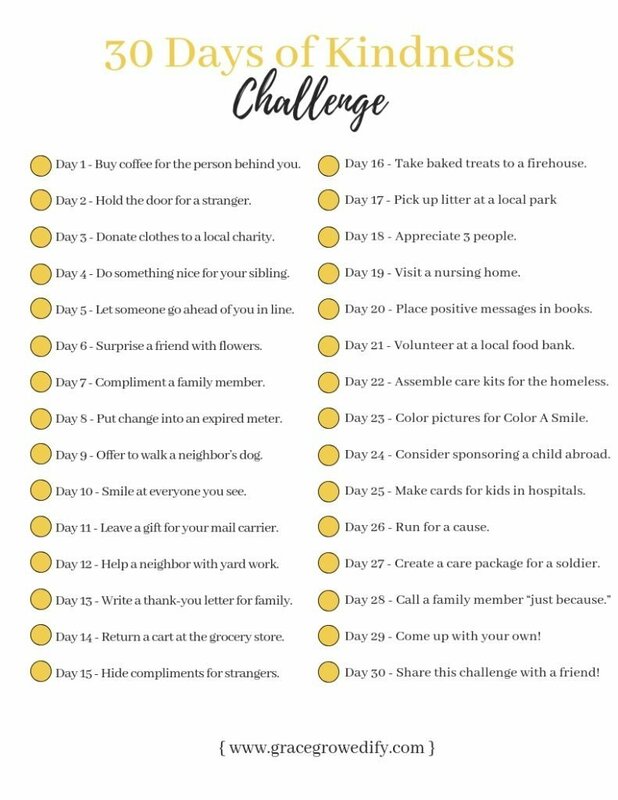 Day 9 – Offer to walk a neighbor’s dog. Day 10 – Smile at everyone you see. Day 11 – Leave a gift or thank-you card for your mail carrier. Day 12 – Help a neighbor with yard work. Day 13 – Write a thank-you letter to a family member. Day 14 – Return a rogue cart at the grocery store. Day 15 – Hide compliments for strangers to find. Day 16 – Bake something to bring your nearest firehouse. Day 17 – Pick up litter at a local park or playground. Day 18 – Tell three people why you appreciate them. Day 19 – Visit a nursing home. Day 20 – Place positive messages in library books. Day 21 – Volunteer at a local food bank or soup kitchen. Day 22 – Assemble care kits for the homeless. Day 23 – Color pictures for Color A Smile. Day 24 – Consider sponsoring a child or an animal for a village in need. Day 25 – Make cards for kids in hospitals. Day 26 – Run for a cause. Day 27 – Create a care package for a soldier fighting abroad. Day 29 – Come up with your own act of kindness! Courtney, wonderful challenge! We all can use more kindness, and this is a great way to teach children to think of others and how much joy it brings to you! Thanks for sharing! Thank you Wendy! You are so welcome.